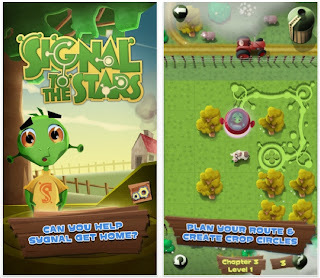 Signal to the Stars is a free topology puzzle app game. The scenario: an alien is stranded. He has a spaceship. Place him on the grid anywhere, then move him horizontally & vertially to cover the grid. The result will be a weird crop circle that will signal his mothership. 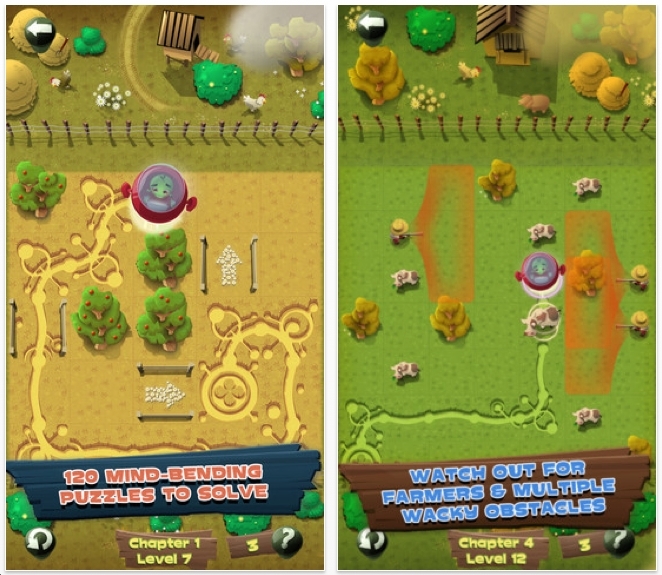 Special features: arrows that determine your movement. Fences that cannot be crossed. Farmers who guard, usually, 3 squares. The farmers must be hit first to free up the other 3 squares. 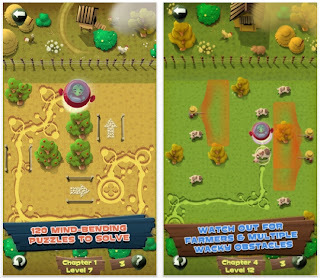 There are 30 free levels. After that $.99 for the next 90 levels and another novel feature: picking up a gadget that allows you to convert a bush into grass. I've done almost all of the 120 levels. Yowsa! 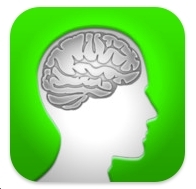 This is a good puzzle app game. 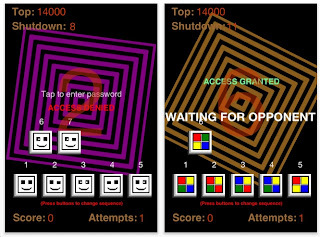 Robert Hardman recently contacted me about his new puzzle app game: Esi-Code Breakers: "On the first level you have to arrange all 5 colours into the correct sequence in order to crack the code. The next level it becomes 6 etc. By tapping on the screen, it tells you how many colours you have in the correct place, then you use logic/memory skills to work out which ones are correct and which ones you have to move before the timer runs out. 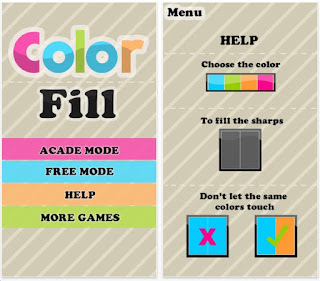 The more colours you have in the correct place, the more points you score if the code is not cracked." You must tap rapidly! I solved the first level. About a month ago I watched Jeopard and was not happy. The topic was geometry and the answer was a triangle with sides 6, 8 & 10. The question from 1 contestant: what is a right triangle. Alex Trebek said 'no, what is a scalene triangle.' Ugh! I immediately switched channels. 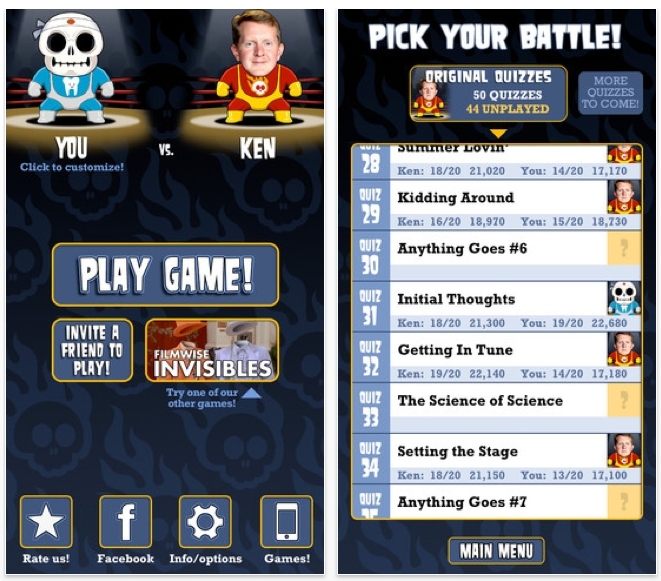 A few days ago I got a promo code to play test Trivia Death Match which pits your skills against Ken Jennings. Each quiz is 20 mulitple choice questions. You get 1000 points for each correct response plus a time bonus for answering quickly. Ken Jennings took 50 of these quizzes. So you get to compare your score to Ken's. I've played this 8 or 9 times......and I've lost every time. However, I was close on a few. Trivia Death Match right now has 50 quizzes and I think they're going to add more. 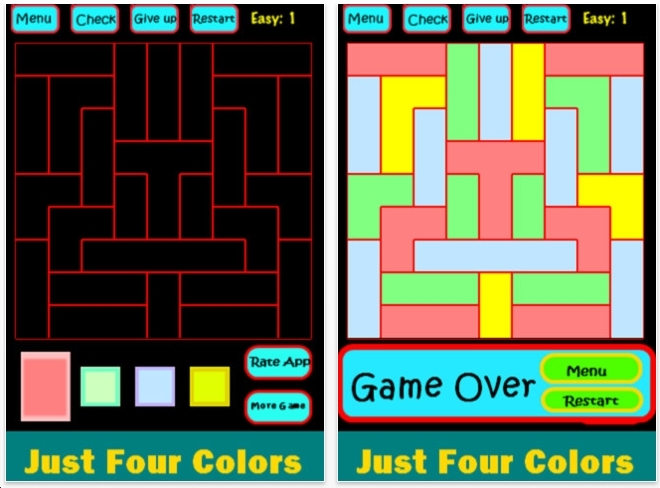 Normally, this blog focuses on pure logical puzzle apps. 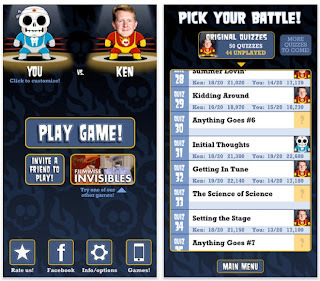 However, Trivia Death Match is fun and worth your time! 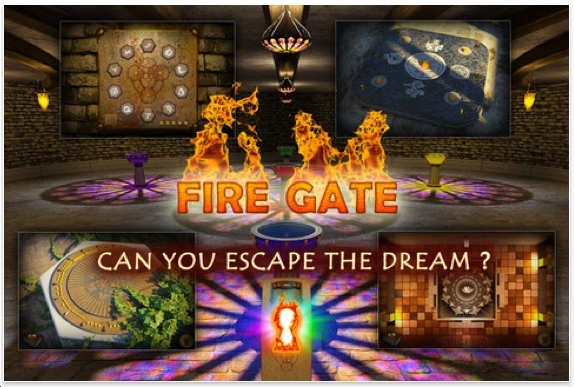 Dani Ohayan from http://www.mercurymaze.com/ has released Dreams of Spirit: Fire Gate. The best way to describe it: it's like Myst, the game from 1994. You awake in the center room of a strange building. 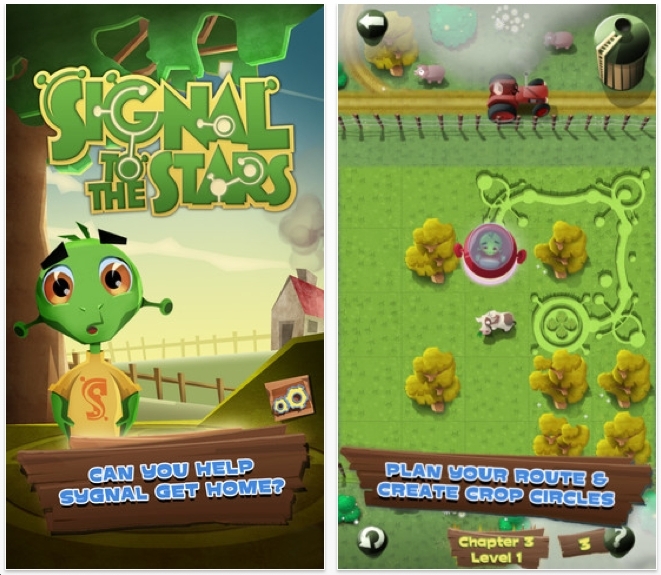 You must wander around to find things and solve puzzles. Hints are given freely if you keep playing. 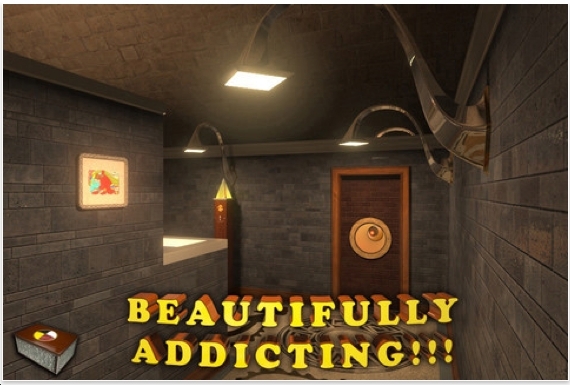 Look at the second image that says Beautifully Addicting. The door has 3 circles on it. To open that door, you must align the circles by rotating them. It has a certain Spirograph feel to it. That's an old toy from the 60's that creates artistic patterns. 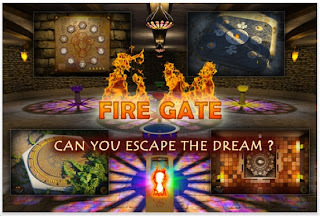 I have not completed Fire Gate. I've been distracted with the flood of new puzzle apps. 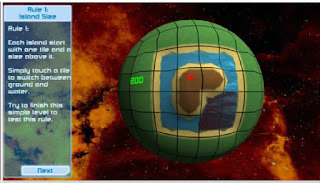 Guillaume Ortega & Eric Caginicolau recently contacted me about their new puzzle app game Islands Planet. You may recall that Guillaume Ortega made Akari 3D last year. 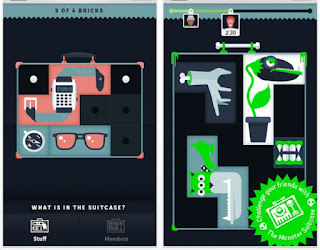 It made the prestigous list of Best Puzzle App in 2012. Such an excellent puzzle app game! Islands Planet: this is a spherical version of Nurikabe from Nikoli press in Japan. Each square is either land or ocean. No two islands can touch each other. Diagonal touching is okay. 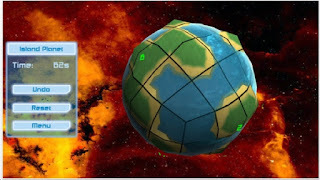 There cannot be a 2x2 grid that contains only ocean. Also, you cannot create a lake that is enclosed. See the second image for that. 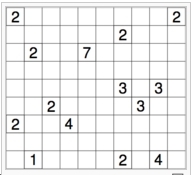 Below is an image of a solved regular Nurikabe puzzle and its solution. 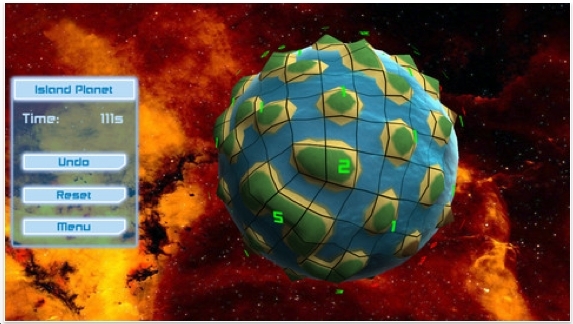 Essentially: each number indicates how many squares are on its island. Islands may touch each other diagonally, but not otherwise. Now look at the solution: notice that there are no 4 black squares in a 2x2 grid. Islands Planet has exactly the right number of puzzle levels: 20 easy, 20 medium, 20 hard & 20 very hard. I've done all of them! It took about 2 weeks. I definitely struggled on some of them and had to restart. Islands Planet is absolutely one of the Best Puzzle App Games of 2013. The graphics are outstanding. Most importantly, the puzzles are fun! 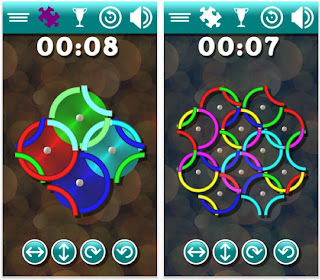 Eric Kelsic, Alex Sheive and Alex Sutherland from ALX Games recently contacted me about their new puzzle app game: Spinpossible. The object is to grab sets of numbers and rotate them to restore order. If you can grab the first 2 rows, then 1, 2, 3 will become 3, 2, 1 upside down on the second row. Of course, you could also grab all the numbers 1-9. Or just a column. Or even a single cell. I like Spinpossible. 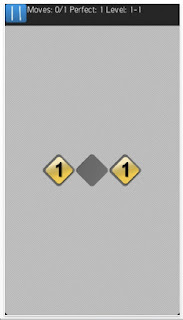 However, in order to advance, you must get 3 stars for each level. 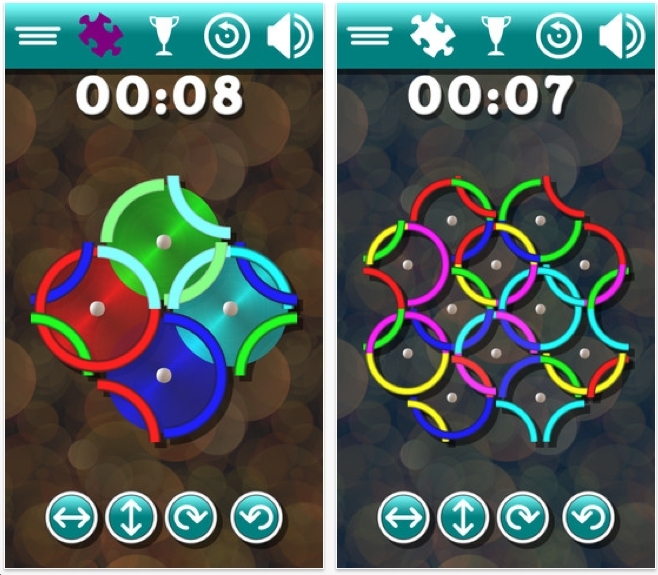 Spinpossible is a serious puzzle app game. I particularly like the graphics. I have 1 qualm: the user should be allowed to play any and all levels and not have to earn his way step by step. 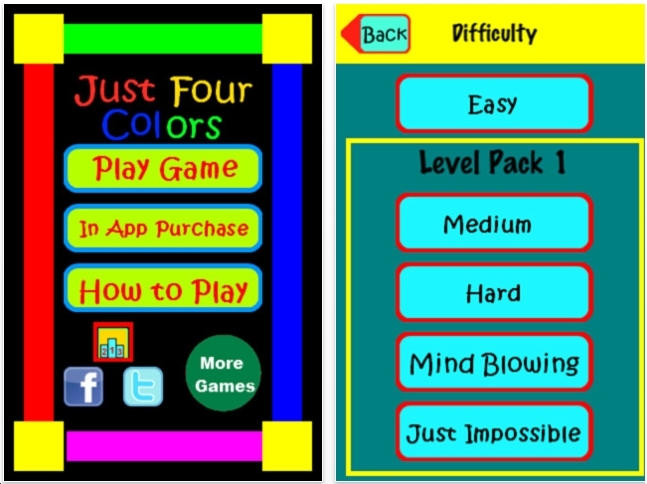 For example, on another puzzle app, I'm stuck on level 63 & 87. But I did have the opportunity to do #64 - 100. Sequential Movement Fans: give Spinpossible a chance! 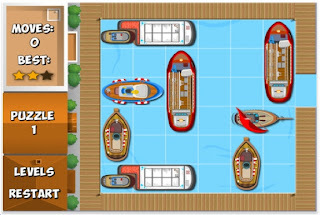 Ship Shuffle is the latest ripoff of ThinkFun's Ship Shuffle. I believe this is the 4th ripoff this year. On another note, have you signed up as a follower? 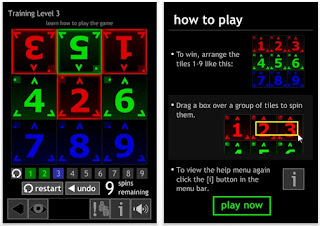 Are you playing puzzle apps that I have not reviewed? Feel free to contact me. 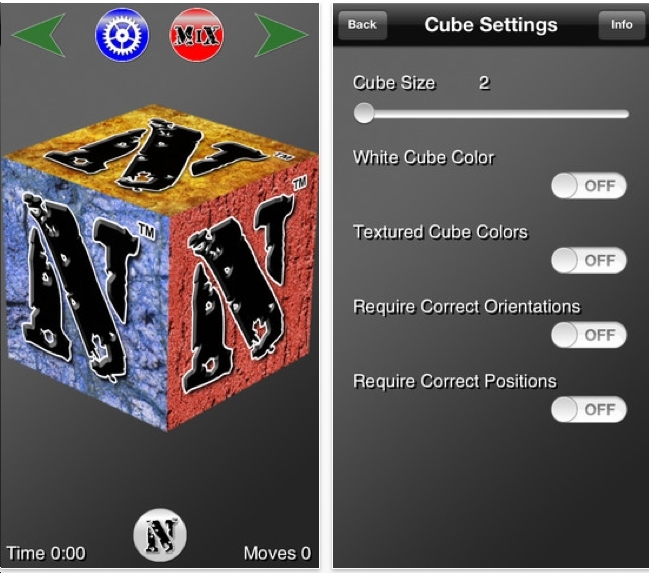 nQubed comes from Gregory R Wathen. Practice your cube solving skills from a 2x2x2 to a 7x7x7 cube. 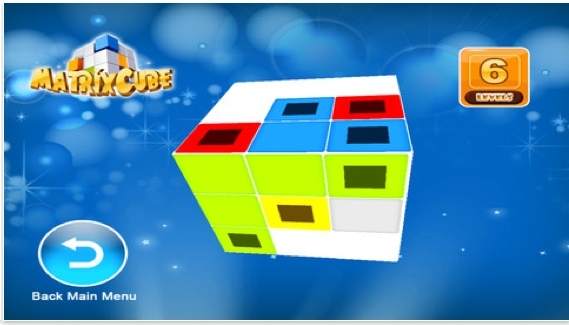 Want to get the orientation of the inner cubies right? The option is there for you. Me? I've always been content to solve all the faces - good enough for me. 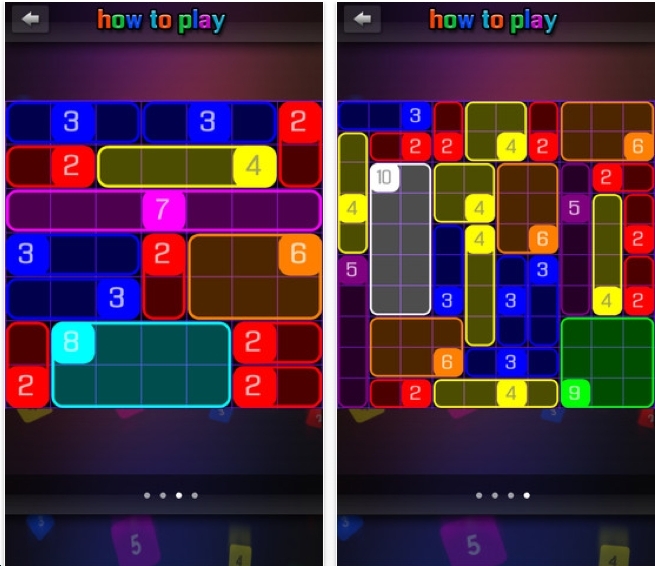 Swapagon is an interesting puzzle app game. Timo Heister is the author. The object: rearrange the squares on the grid so that the numbered tiles are next to that number of other tiles. Thus: a 4 needs to be surrounded on all sides by other tiles. Diagonal touching does not count. 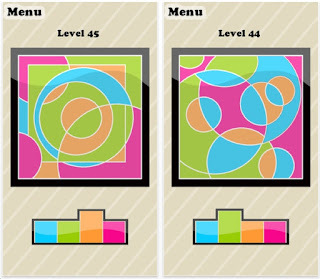 We've seen this type of puzzle app game before. This is well done. And hey, it's free! 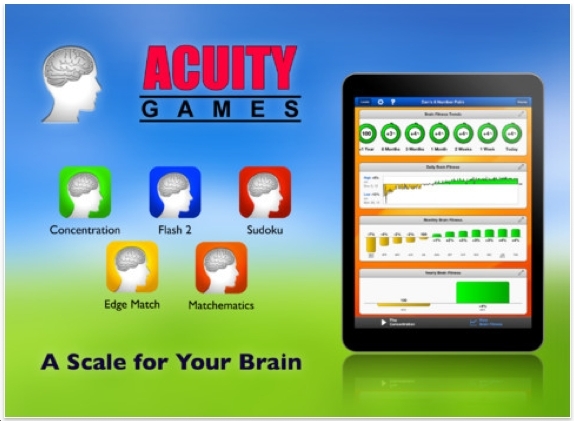 Acuity Games has a mission: to train your brain to work fast to ward off Alzheimer's. 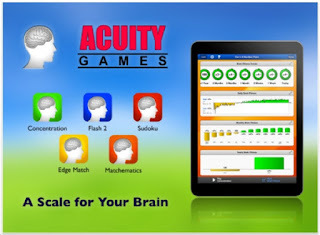 There are a number of games: Sudoku, Concentration, Mathematics, Edge Match. 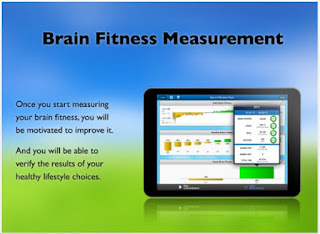 Play the games fast and improve your time. Get smarter! 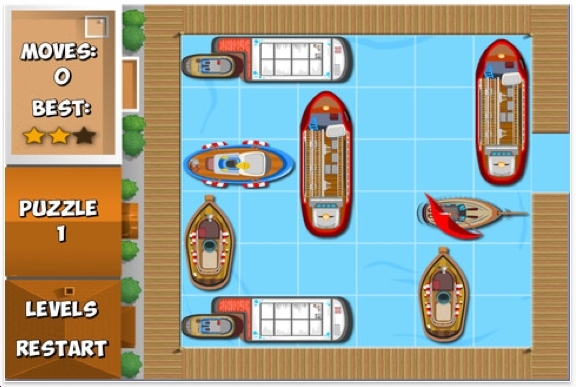 If you know somebody with Alzheimer's, have them try these games. Perhaps it will help. 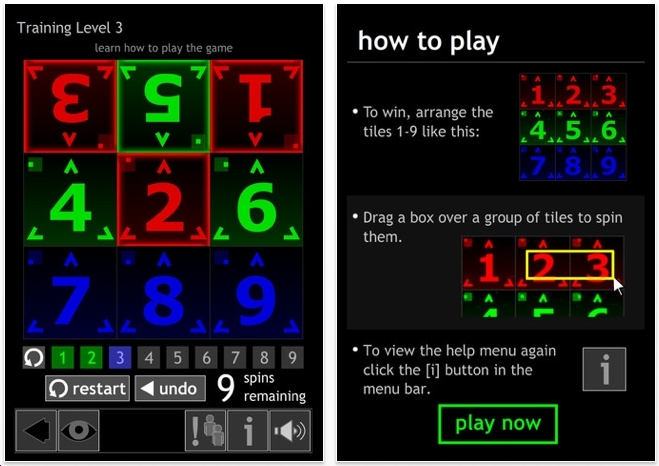 Ken Tylman recently sent me a promo code to play his new puzzle game app: Rynglets. The object is to rotate each circle so that the rings will transfer to their matching circle. The individual circles can also be flipped over via their horizontal line of symmetry or the vertical line of symmetry. This is a very serious challenging puzzle app game! 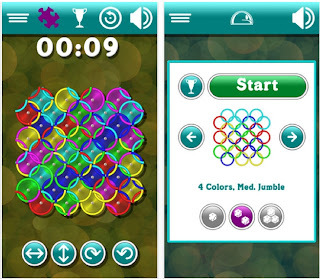 Side note: on December 31, I will publish the list of Best Puzzle Apps of 2013. Stay tuned. 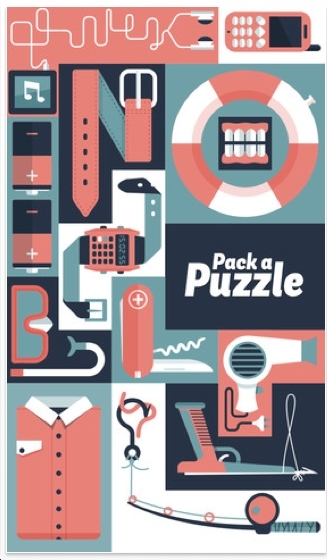 Kasper Bøttcher recently contaced me about his new puzzle app game: Pack A Puzzle. The object: fit the pieces into the grid. 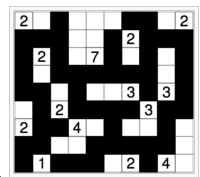 We've seen this type of puzzle numerous times. Here's what's cool: the rectangular grid will change sizes as you position the pieces. The final objective is to get them into a suitcase sized grid. Very sleek. Do you know the song I'm Leaving On A Jet Plane? John Denver wrote it and Peter Paul & Mary made it famous. On the app store for Pack A Puzzle, they've changed the lyrics. There is a Lite version of Pack A Puzzle. Give it a try. 'Color Fill !!!' is the name of this puzzle app game. The object it to color your map with just 4 colors or less so that no 2 neighboring countries have the same color. We've seen this type of puzzle game app before: Just Four Colors and Quartzic come to mind. Hey, this is free. But it's not my favorite type of puzzle. 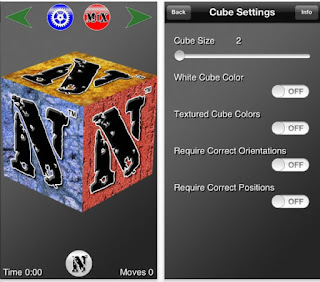 Does this puzzle app make it onto the prestigous list of Best Puzzle Apps of 2012? 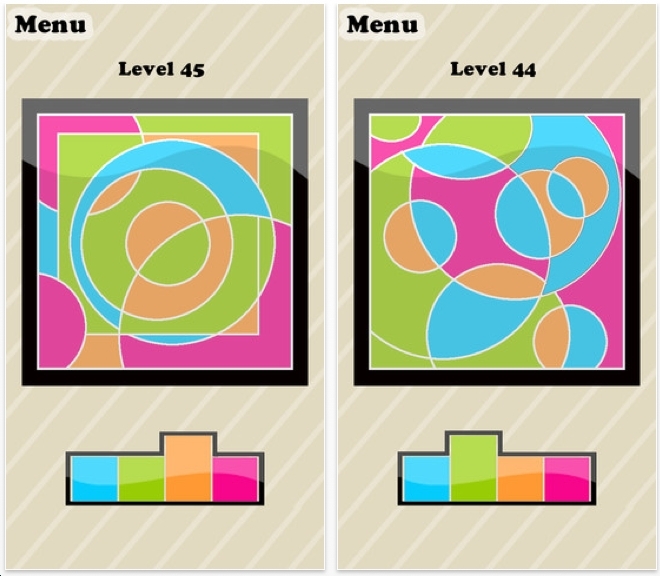 Just Four Colors is based on an old math theorem: any map can be colored using just 4 colors so that no 2 neighboring countries have the same color. We've seen this on the app store a few times. Quartzic is another title. There are 10 free puzzle levels. After that, you must pay. 300,000th visitor - will it be you? If you're the 300,000th visitor, take a screen shot and send it to me via email. Then I'll send you a prize. Nothing expensive. Sorry, my budget is low. The image basically shows the objective. You are given a grid with numbers. Draw rectangles that have exactly that many boxes. We've seen this type of puzzle game for many years. Nothing new here. Also, they're not too tough. However, I can picture novice puzzlers saying: brilliant. Hey, it's free. 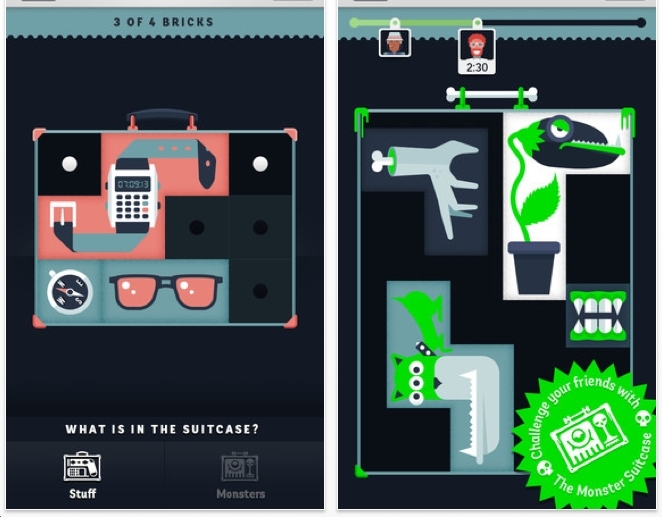 But this will not make it onto the list of best puzzle apps of 2013. Sorry. Matrix Cube is very similar to Lab Mice Puzzles. See the link just to the right of this column. The object is to connect the red squares with a red path that do not intersect with the blue path or green path etc. This concept of doing this on a cube is not new. 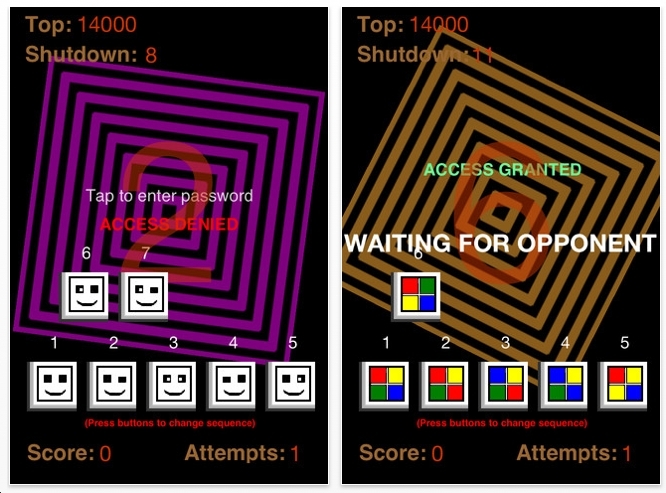 Still, this puzzle game app is free. 30 levels.